Getting of a train in hood while impatient Londoners are waiting to push past you only to step back in surprise as they see you… Always a giggle. Alas there was not much to see or do at Westbourne Park. It was only later that I found out if we had left the Underground station and headed to the Network Rail station, we could’ve peered over and watched CrossRail work happening. There was some fun with taking the photo at the roundel, as space was a premium so Echo and I ended up getting a photo each. Before long it was time to jump on the next train and move on. The branch was almost over, soon we would hit the main circle of the Circle Line. 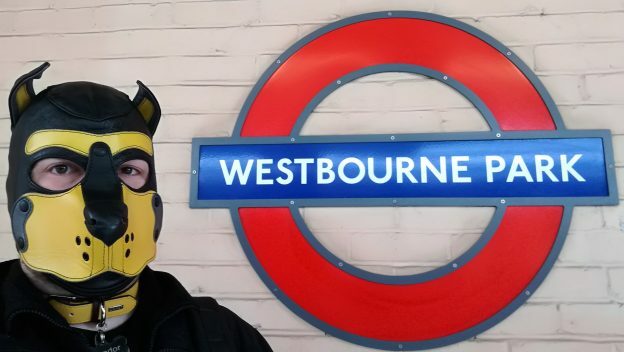 Echo laments it’s not called Westbourne Bark at Westbourne Park (Underground) station.